Teaching or being a therapist or in a caring profession means keeping in touch and developing our own resources. In this module you will see what your resources really are, what supports and what doesn't and a way to develop your resources in such a way that you can have the ability to stay well as well as be able to be vulnerable and real. We will use systemic constellations to explore how resources work. On Saturday we will begin with embodied anatomy and somatic enquiry... These weekends are a journey through the elements as a way of coming into contact with our body heart and soul. 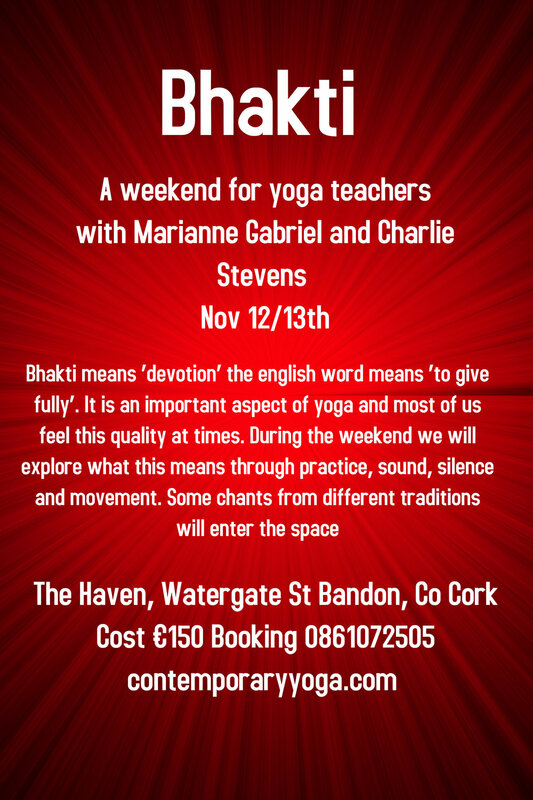 Here we bring together the Original Yoga, Sacred Movement, Breath Inquiry, Sound and Silence. The anatomy and the creative way we work in body/mind has arrived through a synthesis drawn from many different approaches. It's starting is from a felt-sense of a need to follow our bodies desire to move and 'be moved' allowing for how I would like and need to move. This desire can be explored through asana practice and Moving Meditation using the feminine principal of intuition, receptivity, ease, pleasure and strength. There is always space and time to allow for what arises with our personal process with writing and art. Discovering your own wisdom with the help of others. A dive into the philosophy of yoga supported by meditations and in depth enquiries with connections to other spiritual disciplines and teachers.